Congressman @farenthold is a lawyer, sits on @HouseJudiciary and calls for #SethRich investigation. "Kim is planting #SethRich evidence"
Seth Rich's new "family spokesman" is Brad Bauman a professional Democrat crisis PR consultant with the Pastorum Group. @carsdotcom SO YOU ARE THE FIRST ONE WHO PULLED YOUR ADVERTISEMENT FROM SEAN HANNITY? See my comment to Sean's Advertisers and I hope you do as well. He is being slandered, bullied and harassed. I KNOW THAT SETH RICH WAS INVOLVED IN THE DNC LEAK. I know this because in late 2014 a person contacted me about helping me to start a branch of the Internet Party in the United States. He called himself Panda. 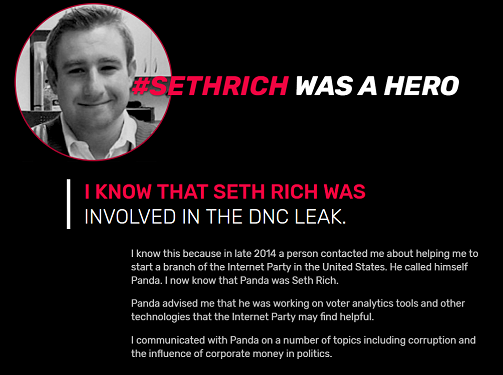 I now know that Panda was Seth Rich. Panda advised me that he was working on voter analytics tools and other technologies that the Internet Party may find helpful. I communicated with Panda on a number of topics including corruption and the influence of corporate money in politics. “He wanted to change that from the inside.” I was referring to what I knew when I did an interview with Bloomberg in New Zealand in May 2015. In that interview I hinted that Julian Assange and Wikileaks would release information about Hillary Clinton in the upcoming election. The Rich family has reached out to me to ask that I be sensitive to their loss in my public comments. That request is entirely reasonable. I have consulted with my lawyers. I accept that my full statement should be provided to the authorities and I am prepared to do that so that there can be a full investigation. My lawyers will speak with the authorities regarding the proper process. If my evidence is required to be given in the United States I would be prepared to do so if appropriate arrangements are made. I would need a guarantee from Special Counsel Mueller, on behalf of the United States, of safe passage from New Zealand to the United States and back. In the coming days we will be communicating with the appropriate authorities to make the necessary arrangements. In the meantime, I will make no further comment. Megaupload founder and friend of Julian Assange has offered to provide Congress with written testimony and proof that murdered Democratic National Committee staffer Seth Rich was WikiLeaks’ source — if they will include his murder in their Russia investigation. Kim Dotcom has also now claimed that he was involved in the leak — and that he personally knew Rich. (...) Dotcom also accused the DNC of withholding their servers from the FBI because “Seth Rich ain’t Russia!” Additionally, the tech entrepreneur provided three email addresses that he claims belonged to Rich: Seth.c.rich@gmail.com, Panda4Progress@gmail.com, and Pandas4Bernie@gmail.com. He urged Google administrators to send the contents of the accounts over to WikiLeaks. May 16, 2017 Former DC homicide detective goes on 'Hannity' to discuss his probe into the mystery surrounding Seth Rich's murder. #SethRich was alive/awake when cops found him, died at hospital. Cops wore body cameras. @KimDotcom @wikileaks Hi! Please read the site I created https://t.co/GVarHuVW5r with the DM's between @GUCCIFER_2 & myself. He mentions Seth Rich. Your opinion? The murder of #SethRich was covered up by the DC Police as a "robbery" - but there is zero evidence to support that. Guccifer admits he is not the DNC hacker. He says the whistleblower is “seth”. Guccifer 2.0: his name is seth.he was my whistleblower I suppose you know who I’m talking about. Robin Young: Yes, and it was horrifying to hear abut his death. I have no facts, but my opinion is Hillary had him murdered. Young sat on the DMs, because she thought they should be kept private. On the request of Guccifer 2.0 they are now released. The story may explain why the DNC did not allow the FBI to look at its servers. Shortly after the killing of Rich, Redditors and social media users were pursuing a “lead” saying that Rich was en route to the FBI the morning of his murder, apparently intending to speak to special agents about an “ongoing court case” possibly involving the Clinton family. Jul 11, 2016 Parents of Seth Rich saddened by his death. On July 8, 2016, 27 year-old Democratic staffer Seth Conrad Rich was murdered in Washington DC. The killer or killers took nothing from their victim, leaving behind his wallet, watch and phone. Shortly after the killing, Redditors and social media users were pursuing a “lead” saying that Rich was en route to the FBI the morning of his murder, apparently intending to speak to special agents about an “ongoing court case” possibly involving the Clinton family. Julian Assange suggested on Tuesday that Seth Rich was a Wikileaks informant. (...) He seems to suggest on Dutch television program Nieuwsuur that Seth Rich was the source for the Wikileaks-exposed DNC emails and was murdered. Julian Assange: Whistleblowers go to significant efforts to get us material and often very significant risks. As a 27 year-old, works for the DNC, was shot in the back, murdered just a few weeks ago for unknown reasons as he was walking down the street in Washington. Reporter: That was just a robbery, I believe. Wasn’t it? Julian Assange: No. There’s no finding. So… I’m suggesting that our sources take risks. The obvious implications are that the DNC knew the Russians were not involved in the hacking and that they took unnecessary risks with national security. But there are many more. For the Dutch TV program the cover up to get the Queen of Corruption elected takes precedence over exposing murder, fraud and even worse.